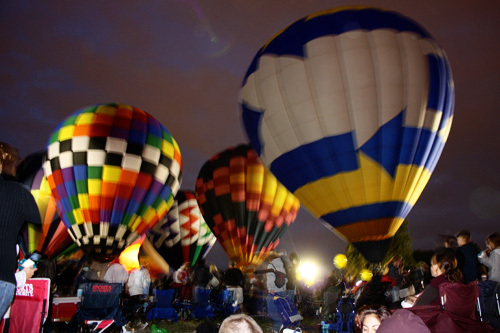 I have always wanted to go and see the hot air balloon glow in Forest Park, it is the night before the hot air balloon race. 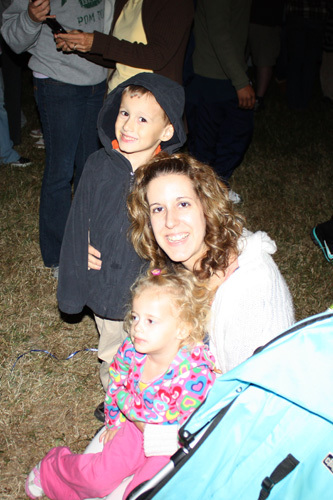 It is late at night, and the last several years just did not work out since the kids would just not function being out that late at night. This year, I thought it would finally be the year to take them, and boy did we have a lot of fun! 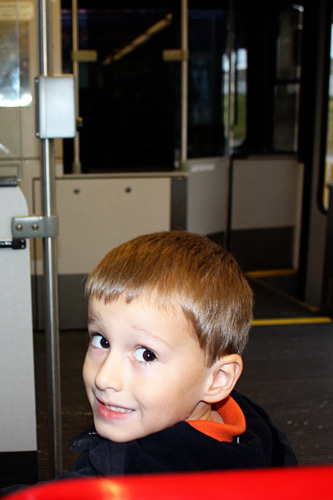 The kids also got to ride on the Metrolink for the first time, and Nathan was really excited about that! 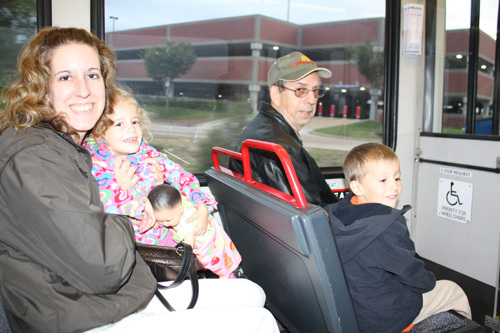 Here we are on the Metrolink, which was really pleasant to ride on the way to the park. However, on the back, it was CROWDED and we were packed in there like sardines! 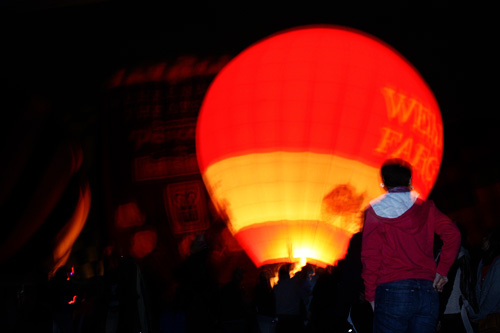 A guy that sits behind me at work said they attempted driving to Forest Park for the glow, and they drove around for over an hour and did not park until 8pm when it was almost over! So, maybe Metrolink was the best route! 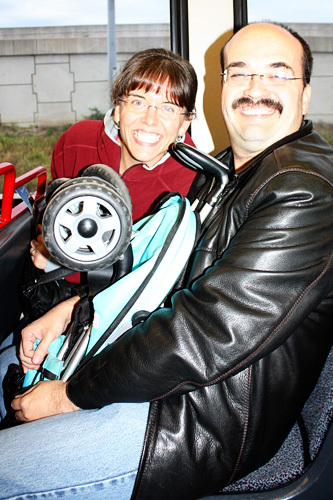 Jeff and Tracy came with us, and Jeff was in charge of carrying the stroller. Whew! Thank goodness for an extra set of hands! Getting to the park from the Metrolink was a little bit of a challenge, but not bad. We had to walk a good 15 minutes from Metrolink into the park, and we cut through the park so there was some fun areas to take the stroller through! Uncle Jeff and Nathan helped me push Autumn in her stroller over all of the muddy patches, sticks and steeeeep hills! LOL! What an adventure! 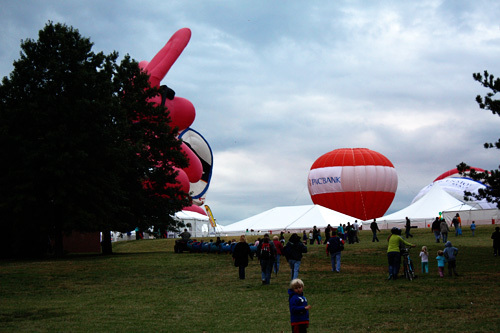 But, it was ALL worth it when we saw the pink bunny ears that belonged to the Energizer Bunny hot air balloon!!!! 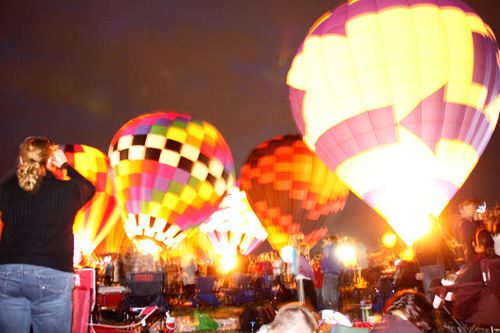 Here is my favorite picture I took all night of the balloons. 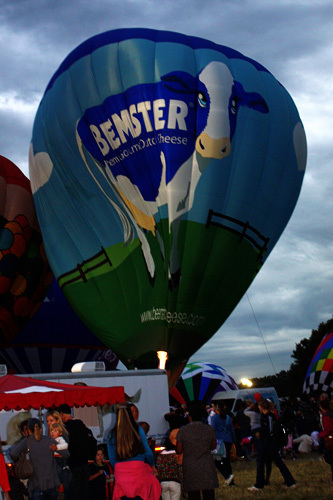 Once it got dark out, they would sound a horn and ALL of the balloons would light up all at once. It was fascinating! 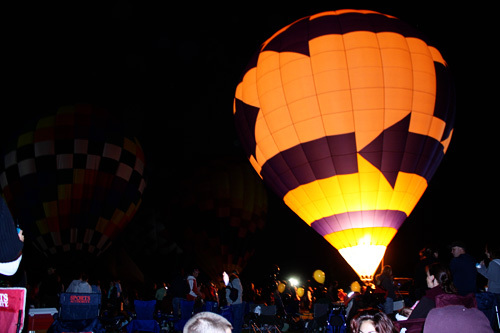 Here is a balloon close to where we were sitting and eating that kept lighting up. Nathan said it was his favorite balloon. 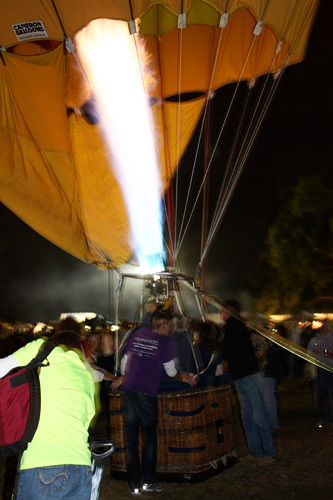 You can barely see it, but the Wehrenberg Theater popcorn bag balloon is behind the balloon that is lit up. 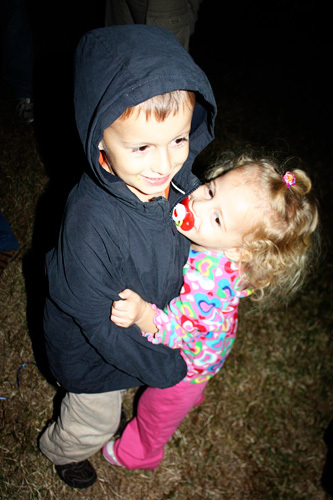 Nathan and Autumn hugging… yes, I had to get the binky out, it was WAY past the kids bed time! 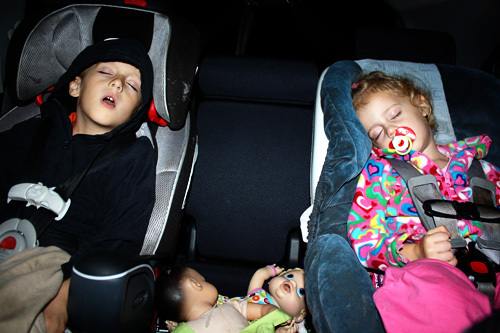 Tired kiddos on the way home. We left before the fireworks, because we wanted to beat the crowds home. We left at a good time, before the kids got too overtired, and THANKFULLY Nathan walked the entire 15 minutes back to Metrolink without needing me to carry him (which I was worried about). Yay!